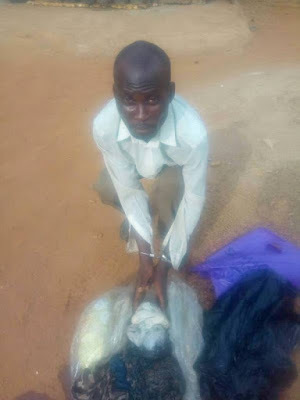 A bus passenger, Ajiboye Emmanuel, has been arrested by operatives from the Ogun State Police Command after being caught with the corpse of a baby reportedly meant for rituals. The Command Public Relations Officer, Abimbola Oyeyemi, who confirmed this today said the suspect wrapped the dead body in a polythene bag. He added that the 42-year-old boarded a vehicle at Sapade garage in Remo axis of the state, on December 22, with the polythene bag he was carrying. Mr. Oyeyemi said the odour emanating from the bag aroused the suspicion of people in the motor park who quickly alerted the police at Isara Division. “Upon the information, the DPO of Isara, Yusuf Taiwo, led policemen to the scene where the suspect was promptly arrested,” he said. The police spokesman said after searching the bag, it was discovered that a dead baby was wrapped therein. He said, the police, not satisfied with the claim, took the suspect to Isara Division for further investigation. Premium Times learnt that the police are working on a hunch that the baby may have been killed for ritual purposes. The Commissioner of Police, Ahmed iliyasu, has ordered the immediate transfer of the suspect to homicide section of the state criminal investigation and intelligence department for proper investigation. All those stupid men using innocent babies for ritual God will be punishing you guys and no peace for the wicked nonsense.